#1.1 Top 7 Car Gun Safes on the Market! #1.2 How to Choose a Car Gun Safe? Not everyone believes in having an additional safe for their cars, but a good car safe can definitely enhance the safety of everything that you carry along and tend to leave in the car. In this day and age with crime escalating all over the world, many people have decided to carry their firearms along and this can have both a positive and negative impact on society. The positive being that you will always be protected when danger arises and the negative is the fact that if your gun is not safely concealed or at least secure when traveling, it could easily be stolen and even result in harm to someone else. You’d think that any small safe will simply do the trick and work inside your car, but that is not the case and some of the top car safes have been specifically designed for this. Other small and portable safes might be great looking and full of fancy features, but you need the best car gun safe to ensure that it fulfill its primary responsibility of keeping your valuables and especially your firearms safe from theft. 7 Best Car Gun Safes on the Market! If you are looking for something quiet and easy to access, the Sentry Safe Biometric Quick Access Pistol Safe Model # QAP1BE will be the perfect fit for you. The safe does not have any feedback when closing or locking. While this may seem dangerous, it could be extremely beneficial and could save you a lot of noise in the evening should something occur and silence is required. The one-handed access feature is a great addition and will allow you store this small and compact safe out of sight to easily. If you cannot enter with a fingerprint, the safe still offers users the ability to use the electronic keypad to quickly and silently open the safe. The safe is made to withstand tough conditions and can face a lot of wear and tear. The body is reinforced with 12 gauge solid steel construction, giving you all the strength without sacrificing the weight of the safe. Because of the lightweight frame, this safe can easily be stored on most shelves and the style will even give you the ability to disguise it amongst books or other boxes. Finally, the compression powered gas strut will keep this box safe open and allow you to take out and insert all the items without having to fear that the lid may crash down on your hands. This also adds to the one handedness feature that will give you further functionality. If you may have lost your password or if your fingerprint does not register, the safe has included an override feature. It will allow you to enter a new passcode and register your fingerprint again, but don’t fit as the override key also works with a passcode that only you will know and the intruders will not be able just to enter the safe. The safe is big enough to keep 1 J&K revolver, full-size semi-automatic handgun. With this size you will have not only the ability to store a lot of documents but also the capacity to store some of your jewelry. The jewelry can be taken out and easily stored every day without prying eyes looking where you have stored them. Overall this is one of the best biometric gun safes, perfect for men and women alike. The lightweight frame will make it easy to use for women to keep their jewelry out of harm’s way and men can store their handguns quite close to where they generally are in the house. This safe could be a great addition to your bedside and will keep you and your valuable safe. The Vaultek VT20i Biometric Handgun Safe is one of the most technologically advanced safes on the market. The safe is fitted with an internal LED light to help you easily find your firearm of any important documents during the darkness of night. No more struggling to get your firearm. The Vaultek safe is the ultimate handgun and document safe. The small compact frame is perfect for having the safe close by and keeping it hidden away under items or inside your drawer. The safe comes with screws and a cable that will allow you to tie it down easily and mount it anywhere in the house and this safe can even be used in the office to store documents and high-value items. The safe allows you to connect via Bluetooth and this app will immediately notify you if someone is trying to access your safe. The safe has biometric features, but one of the key features is the ability to remotely open the safe if someone needs to access the gun and you are not present. This may force you to keep your mobile phone safer. The 16-gauge carbon construction is made to withstand impact and when you add the anti-impact latches, this safe can fall down and still will not be forced open. The anti-pry bars are great for ensuring that no one can force open your safe when you are not present and this safe has been tested through extremely high temperatures. The safe is kind of new on the market, but with all these features, it is sure to make a significant impact on the market very soon. The lithium-ion battery lasts for up to 4 months and can easily be recharged. The safe will also notify you if the battery is running low, making sure that you always have access to your safe in times of need. Overall we like to consider this as on the best biometric gun safes for the portability and the easy-to-use features. The app will notify you of anything that may be wrong and you can remotely open the safe for someone in need. This safe is perfect for keeping at home or office and to use as a drawer safe. The Amsec PS1210HD Heavy-Duty Pistol Safe is one of the perfect examples of what can be considered as the ultimate man box. The safe is quite small, but it still has enough storage space to allow users to store most handguns with at least one clip of ammunition inside the safe. The interior of the safe has also been foam padded and this will add some protection against impact and even keep most of you breakable valuables from smashing against one another when you move the safe. The safe will also be great for women to store their most precious jewelry as we believe that the safe might be too small for all of it. The exterior has been designed from solid steel and the door has been uniquely designed to help ensure that no one can pry open the safe. There are some weaknesses on the side of the safe that we have noticed and we believe with enough time, intruders will be open to break open the back side of the safe. This can all be taken care off once you mount the safe in more difficult to reach areas and thus the safe will be great. The door is one inch bigger than the body of the safe and this will add to the pry-resistant features that the safe already has. The metal finish will also ensure that the safe cannot be damaged from falling and that common household equipment will not penetrate or even damage the exterior. The safe also features a simplex mechanical locking system that will give you faster access to your valuables. The simplex locking system uses the standard mechanical base, but you will never need to worry about finding the right key and you will have quick and efficient access to your items. The large mounting bolts have also been included and the safe can easily be mounted to ensure that no one can move or steal the safe. With the right equipment, the safe can even be mounted in most motor vehicles. 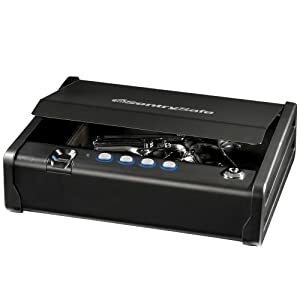 Unlike other box safes, this one features unique carrying handles that will allow you to carry the safe along as you move. This will be a huge advantage to businesses like restaurants and to travelers that need to conceal their firearms and cash. The safe is highly recommended to traveling men and we believe that it will hold most of the items that men hold dear and need to be protected. The safe is quite affordable and it should also make a great gift for any gun owner that does not currently own a gun safe. The Fort Knox gun safe is great for single gun owners and the safe offers a lot of value to these owners. The interior has been foam padded and this will be great for keeping the gun safe and ensuring that it can resist impact to a higher degree with all of your valuables inside. The safe is also great for adding jewelry and we also believe that you will be able to add a few clips of ammunition. The box has been perfectly designed for use in motor vehicles. The safe features a 10 gauge steel constructed frame and the door features a new and revolutionary wrap around the structure that will ensure that the safe is even more pry-resistant than some of the safes with a similar design. If you add the fact that no hinges are present, you will have a virtually impenetrable safe when it comes to common household tools. The exterior has been powder coated to provide a better and stylish look. Once you feel the safe, you will notice that it is smooth and it will be great for adding extra protection to the already impact resistant features. The powder finish will also ensure that it never scratches and that rust never sets in. The safe features a push-button simplex combination locking mechanism with up to 1081 different locking combinations to ensure that the combination cannot easily be guessed. The locking mechanism will trigger the durable inner live action bolt and this will ensure that your valuable and firearms are always fully protected. 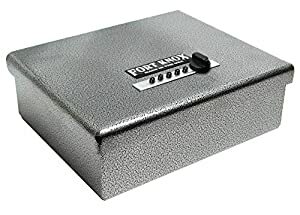 The safe is quite heavy for the small size, but this will only add another layer of protection as it will be immovable once you have dead bolted the safe to the ground of anywhere that you may need it. We highly recommend this as a car safe as well. You will receive a lifetime warranty against any manufacturer defect when purchasing the safe. This is one of the ultimate signs of confidence from the manufacturers as the safe already commands an expensive price. The safe also features a added gas strut to help keep the safe open when it is unlocked and this will make it the perfect one handed operating safe. The safe is also big enough to store valuable documents and smaller files. People looking for a portable but efficient safe will find great value from the safe and single gun owners will also be able to turn the safe into the ultimate man box. The safe might be a little heavy, but we believe that the weight will only add to the overall protection. 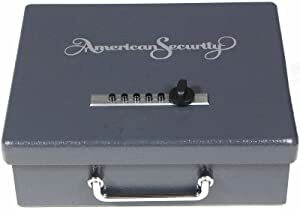 Overall, once you get past the price and you notice the value and quality in the safe, you will be able to get great use out of it for multiple years. When a manufacturer offers you a lifetime warranty, you can know that the safe is made from high-quality materials and is sure to provide you with value. How to Choose a Car Gun Safe? I like to discuss seven things that will make it easier for you to choose the perfect safe and to help ensure that you get the most value out of your safe. These features can be quite costly, but having quality will give you peace of mind and ensure that you have the most value for your hard earned cash. Size. In most cases, it is relevant to look at the size of the safe and this is really true when it comes to your car safe. Some people like to think that bigger is better, but this is not the case when it comes to your car safe. Smaller safes will also force you to carry along less valuable items and even though this might not seem like value, it certainly helps when your car is stolen and you have a lot of your valuables safely kept away at home. Internal composition. After consulting with a few professional gun safe designers and many of the people who already have these safes installed, everyone recommends cushioned or foam interior. Should you happen to be in an accident, this softer cushioning will help keep everything in order and your safe will be impact resistant. The safe is also less likely to allow the firearm to dislodge a bullet when it is impact resistant. Locking type (outside). The lock type that opens the safe is important in all circumstances, but when you buy a gun safe for your car, you should be looking for something that will give you faster access and will not require you to look for the keys and get through the fiddling process. While the simplex push button safes work perfectly for those who are not yet ready to move up with technology, the biometric fingerprint scanner is recommended for faster access. Locking type (internal). In the bigger safes for your home, we always preach live action bolts when it comes to the lock, but with cars, this could take longer to open if you choose to go with the push button lock. The hook and clip lock will give you faster access, but it can also be easier to pry open and this is even truer if the hinges are on the outside of the safe. I like the smaller live action bolts and believe that they will be great and provide fast access with a biometric lock. Design. Does the safe feature a door and is it square or rectangular? This really makes a difference when it comes to finding the ideal place to hide your safe. 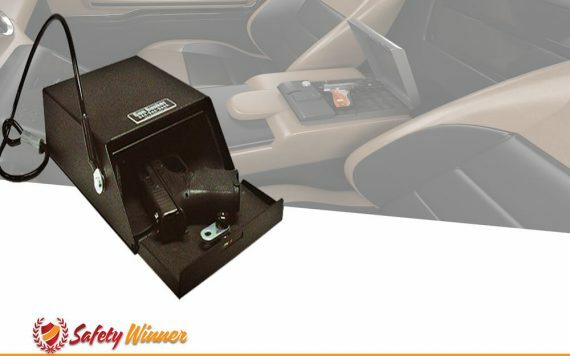 With the current design of most cars, the smaller and rectangular safe should be much more efficient and you should be much more inclined to find the best hiding spot for your car gun safe. The standard box safes will be great when mounted in your trunk, but once again this will limit the access. Mounting tools and requirements. Car gun safes can be hard to mount, especially if you decide to use deadbolts. We recommend finding the perfect hiding spot and then searching for a safe that will fit inside the particular hiding spot. This will allow you to be more clinical when it comes to choosing the correct gun safe for your car. Added opening help. While we already know how important fast access is, it will be great to have something that will help speed up the opening process and even keep the safe open for you to get the firearm with one hand. These one handed safes can be a little more expensive and they are all fitted with additional gas struts that will open the safe for you and even keep the safe open.